Twenty-eight units of affordable housing along Columbia Street would be preserved through the deal, the Carroll Gardens Association said. COLUMBIA STREET WATERFRONT DISTRICT — A neighborhood nonprofit is striking a deal to sell a Columbia Street plot to a private developer in hope of preserving 28 affordable units nearby and possibly creating dozens more with its profit. Carroll Gardens Association is seeking to sell 163 Columbia St., a vacant site near Degraw Street, to Avery Hall Investments for "twice the market price," according to Vilma Heramia, executive director of the group. Though she declined the provide the exact sale price, the funds will go toward making 28 units of below-market rate housing permanently affordable and possibly developing 70 more units in Red Hook, she said. 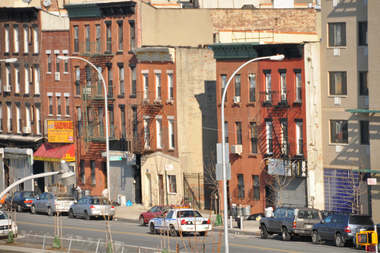 The 28 affordable units are located in six buildings along Columbia Street — 143, 149, 151, 159, 165 and 201, which also houses the association's office. The association fully acquired the buildings and the vacant plot — a portfolio known as the "South Brooklyn Renewal HDFC" — from the city in 2012, but the nonprofit has controlled the sites since the early 90s. The units are marketed to individuals who earn less than 60 percent of the area media income, and 30 percent of the apartments are set aside for homeless people. The affordability guarantee would expire by 2044 without the funds. Avery Hall Investments plans to build a four-story building with a fifth-story set-back penthouse, according to a spokeswoman for the company. The developer has a similar residential building in the works for the neighboring property at 161 Columbia St. If the deal is approved, construction is expected to begin this year and would be completed by mid-2017. The construction at 163 Columbia St. will be a four-unit building, according to Councilman Brad Lander, who took part in the negotiations that also involved the city's Department of Housing Preservation & Development. The lot, located on the same block as Pok Pok NY restaurant and Freebird Books, has sweeping Manhattan views just past the Port Authority marine terminals. “This is a good deal for the Columbia Waterfront neighborhood, that permanently preserves affordable housing and much-loved open space," Lander said in a statement Monday morning. "By allowing the Carroll Gardens Association (CGA) to sell the long-vacant lot at 163 Columbia Street to Avery Hall Investments ... we will achieve three great community goals," he said. Those goals include both preserving and providing seed funding for creating additional affordable housing, as well as securing the transfer of two gardens — South Brooklyn Children's Garden and Pirate's Cove Community Garden — to the Parks Department so they can be maintained as local green spaces. "This really is a win/win," Lander said. While 163 Columbia St. was initially planned as an open space, Heramia said it would be "overkill" because of nearby community gardens as well as the future Columbia Street waterfront park. But the search for developers proved challenging because of the compact size — roughly 1,991 square feet — of the property. "We met with several developers and no one was interested in developing such a small property," she said. Talks between Avery Hall and Carroll Gardens Association have been ongoing for two years, and they are now in the final leg of approvals by the city. The sale must still be approved by the City Council. The association and HPD will present the plan to Community Board 6 on Monday evening at Cobble Hill Health Center, located at 380 Henry St., at 6:30 p.m.
Carroll Gardens Association, which has been in existence since 1971, is an affordable housing nonprofit, according to Heramia. It also offers services in small business economic development and tenant advocacy. "The funds will really go to assisting us in our mission," she said.